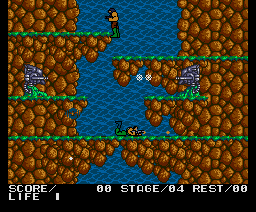 Contra is a run 'n' gun game that was originally released in the Arcades in 1987. It supports single player only and your mission is to stop the Red Falcon Organization from taking over the world. Your trusty Pea Shooter is always available, but other weapons can be collected such as a Laser, Machine Gun or Fireball. Unlike the Arcade or NES (1988) versions, there's no one-hit deaths as you're afforded a generous health bar, making the game dramatically less challenging. Adding to this, there's no scrolling here, and the static screens allow you to walk straight through most sections before enemies even have chance to fire! The weapons are a mixed bag; on one hand, there's a cool and exclusive Rear Gun that shoots in-front and behind you. You can also select weapon types from a menu after collecting icons which is a fantastic idea to aid strategy. Bizarrely though, there's no Spread Gun (despite it being a series staple) and my only guess is that it would have resulted in too much slowdown (possibly why there's no co-op mode either). The nine original levels are heavily neutered, but they do at least retain some of their charm, and it's still fun mowing down enemies across multiple platforms. There's also ten exclusive levels, and while this initially sounds appealing, they all feature terrible design with none of the trademark innovation that the series is know for. They retread familiar ground far too often and even when the game tries something new (such as a right-to-left stage, or a bunker where you work your way downwards), it feels like game design by numbers with random object and enemy placement. Slowdown also becomes a bigger problem the more you progress. Contra on the MSX2 plays like a bootleg version of the NES classic and the condensed level design and lack of scrolling ensure it doesn't hold a candle to its 8-bit brother. There are some unique ideas here, but the new levels do nothing to enhance the gameplay and overall it just feels like a heavily watered down port. Random trivia: In Japan, this version was re-released on the Wii Virtual Console (2010) and the Wii U Virtual Console (2014).